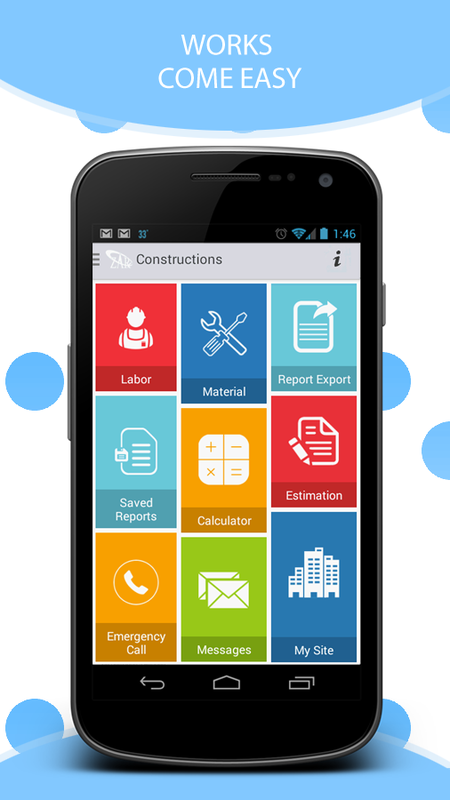 Construction Manager is a Construction Field related Mobile Application that supports 99% of android mobile devices. It serves as a Great Tool for Contractors to quickly create on-site estimates for construction and report project status. This Construction Management Application will help to manage all Construction related projects in real time. It is specially designed to ensure the accurate and regular flow of information, such as maintenance logs and daily reports of labor, material and work completion status. Features: 1.We can create multiple project and can assign multiple engineers to the particular project. 2.Make Project Estimates, quantifying labor, material, subcontract and other costs 3.Management can create and assign multiple contractor to the particular project. 4.Can a set price details of all labor for the contractor. 5.Easier to estimate projects and time sheets between company headquarters and construction sites. 6.User can manage his account with login information for their account which provided by the construction management. 7.Evaluate the amount of work to be made. 8. Estimation Forms and Reports can be generated as PDF or Excel Format and allows user to share via Email. 9.Automatically calculate total cost of labor, material, subcontract and the grand total of the estimates. 10.Save and View generated reports and estimations on mobile at any time. 11.Location of the place can be tagged using map view and it helps to identify the employee location. 12.All labor reports are stored in mobile as we as in server.